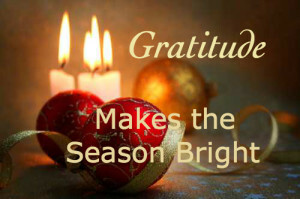 Are you living into the Season of Gratitude? Don’t you love this time of year? What does this time of year represent to you? To me, it represents gathering with friends and family. It‘s the meaning of Joy and Hope. It represents the possibility of overcoming any and all difficulties. The holiday season is the best season for reflection. It symbolizes service, giving and love expressed. I love to use the end of the year as a time to focus on gratitude. What blessings have you enjoyed in 2016? What can you share with others as an expression of gratitude? I have a story to share with you from an author, Robert Fulghum, whose words I really enjoy. Take time to read the story below and focus on your gratitude. Although it was originally published in the Los Angeles Times in 1988, the spirit of this letter still serves us in 2016. A Sunday afternoon it was, some days before Christmas. With rain, with wind, with cold. Winter gloom. Things-to-do list was long and growing like an unresistant mold. Temper: short. Bio-index: negative. Horoscope reading suggested caution. And the Sunday paper suggested dollars, death, and destruction as the day's litany. O tidings of comfort and joy, fa la la la la! This holy hour of Lords day bliss was jarred by a pounding at the door. Now what? Deep sigh. Opening it, resigned to accept whatever bad news lies in wait, I am nonplussed. A rather small person in a cheap Santa Claus mask, carrying a large brown paper bag outthrust: "TRICK OR TREAT!" Santa Mask shouts. What? "TRICK OR TREAT!" Santa Mask hoots again. Tongue-tied, I stare at this apparition. He shakes the bag at me, and dumbly I fish out my wallet and find a dollar to drop into the bag. The mask lifts, and it is an Asian kid with a 10-dollar grin taking up most of his face. "Wanta hear some caroling?" he asks, in singsong English. I know him now. He belongs to a family settled into the neighborhood by the Quakers last year. Boat people. Vietnamese, I believe. Refugees. He stopped by at Halloween with his sisters and brothers, and I filled their bags. Hong Duc is his name--he's maybe 8. At Halloween he looked like a Wise Man, with a bathrobe on and a dish towel around his head. I nod, envisioning an octet of urchin refugees hiding in the bushes ready to join their leader in uplifted song. "Sure, where's the choir?" "I'm it," says he. And he launched forth with an up-tempo chorus of "Jingle Bells," at full lung power. This was followed by an equally enthusiastic rendering of what I swear sounded like "Hark, the Hairy Angels Sing." And finally, a soft-voiced, reverential singing of "Silent Night." Head back, eyes closed, from the bottom of his heart he poured out the last strains of "Sleep in heavenly peace" into the gathering night. Wet-eyed, dumbstruck by his performance, I pulled a five-dollar bill out of my wallet and dropped that in the paper bag. In return he produced half a candy cane from his pocket and passed it solemnly to me. Flashing the 10-dollar grin, he turned and ran from the porch, shouted "GOD BLESS YOU," and "TRICK OR TREAT" and was gone. Who was that masked kid? Hong Duc, the one-man choir, delivering Christmas door-to-door. I confess that I'm usually a little confused about Christmas. It never has made a lot of sense to me. It's unreal. Ever since I got the word about Santa Claus, I've been a closet cynic at heart. Singing about riding in a one-horse open sleigh is ludicrous. I've never seen one, much less ridden in one. Never roasted chestnuts on an open fire. Wouldn't know how to if I had one, and I hear they're no big deal anyway. Wandering Wise Men raise my suspicions, and shepherds who spend their lives hanging about with sheep are a little strange. Never seen an angel, either, and my experience with virgins is really limited. The appearance of a newborn king doesn't interest me; I'd just as soon settle for some other President. Babies and reindeer stink. I've been around them both, and I know. The little town of Bethlehem is a pit, according to those who have been there. Singing about things I've never seen or done or wanted, dreaming of a white Christmas I've never known. Christmas isn't very real. And yet, and yet. . . . I'm too old to believe in it, and too young to give up on it. Too cynical to get into it, and too needy to stay out of it. Trick or treat! After I shut the door came near hysteria--laughter and tears and that funny feeling you get when you know that once again Christmas has come to you. Right down the chimney of my midwinter hovel comes St. Hong Duc. He is confused about the details, like me, but he is very clear about the spirit of the season. 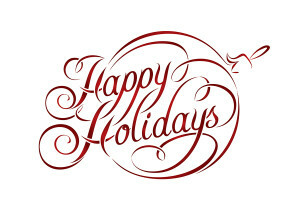 It's an excuse to let go and celebrate--to throw yourself into holiday with all you have, wherever you are. "I'm it," says he. Where's Christmas? I ask myself. I'm it, comes the echo. I'm it. Head back, eyes closed, voice raised in whatever song I can muster the courage to sing. God, it is said, once sent a child upon a starry night, that the world might know hope and joy. I am not sure that I quite believe that, or that I believe in all the baggage heaped upon that story during 2,000 years. But I am sure that I believe in Hong Duc, the one-man Christmas choir, shouting "trick or treat!" door- to-door. I don't know who or what sent him. But I know I am tricked through the whimsical mischief of fate into joining the choir that sings of joy and hope. Through a child, I have been treated to Christmas.